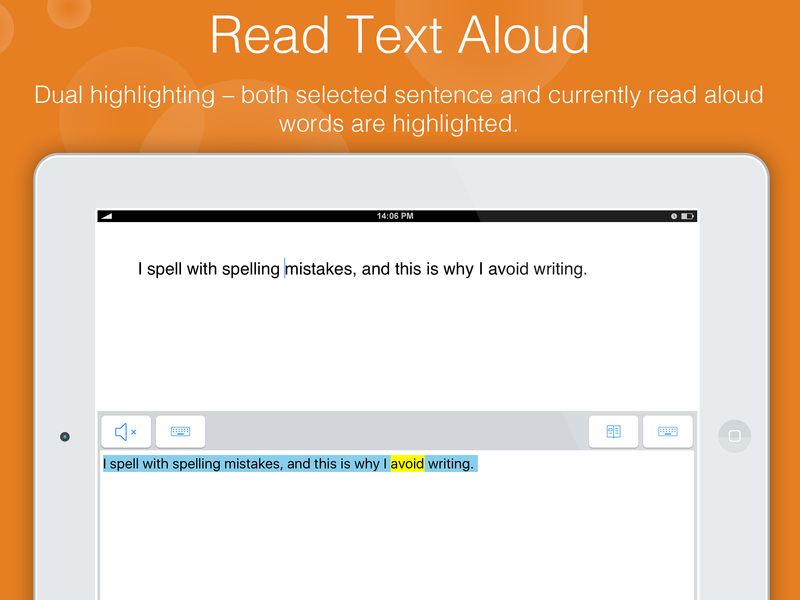 Ghotit iPad & iPhone Dyslexia Keyboard helps people with dyslexia and/or dysgraphia to write and read freely. 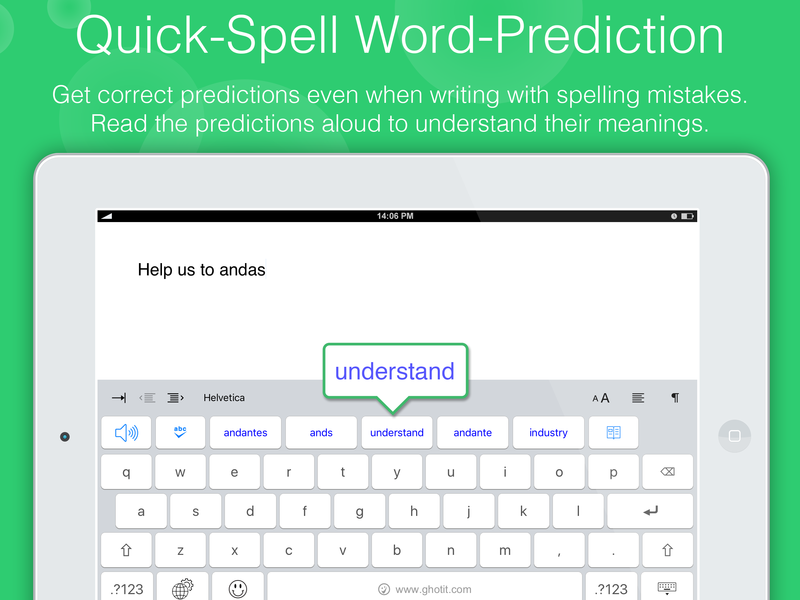 The keyboard predicts words by using Ghotit Quick Spell Word-Prediction, the technology designed for writers with typing issues and phonetic writers; this technology increases writing speed and successfully predicts intended words with instant correction of the first misspelled letters. 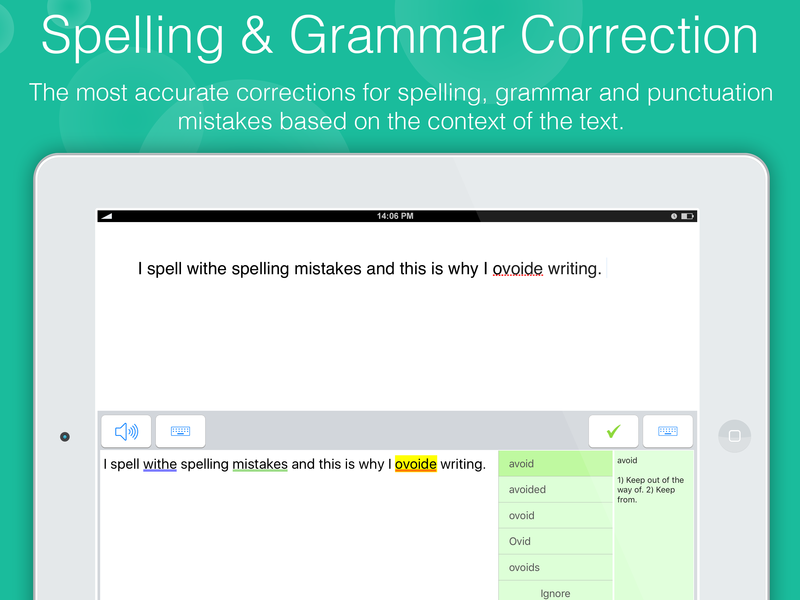 The keyboard corrects texts by using patented Ghotit Text Correction Engine fixing misspelled and confused words, homophones, grammar and punctuation errors made by those with dyslexia. – US, UK, Canadian and Australian English dictionaries. Text correction requires Internet connection. All other features are working offline. Single-Tapping a Predicted Word, reads it aloud. 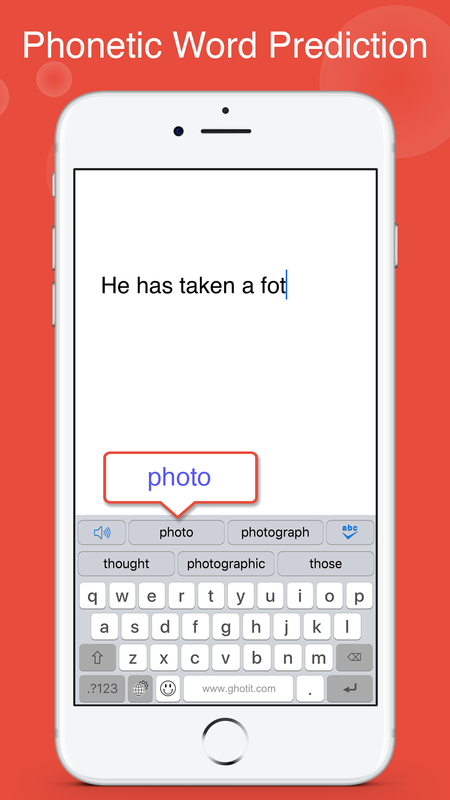 Long-Tap-and-Release gesture provides descriptions/explanations for most words. To select a Predicted Word, Double-Tap it or Swipe it left or right. You can change the behavior in the Keyboard Settings (see below) by enabling “Tap to Select Prediction”. Thus, Single-Tap will select a Predicted Word whereas Double-Tap or Swipe could be used to read it aloud. Mark the sentence to be corrected. To correct a sentence, place the cursor somewhere in the middle of the sentence. Pay attention not to select words. • Tap the ABC button and wait a few seconds. 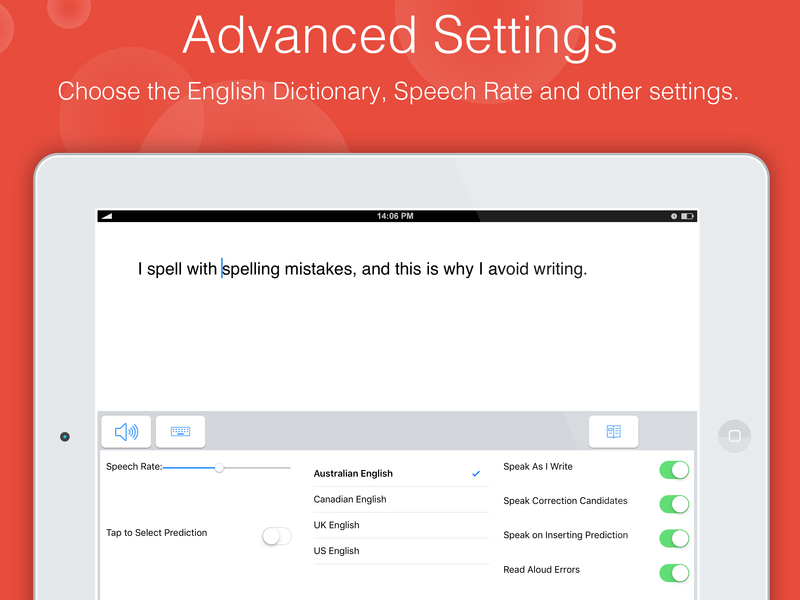 Tap at the underlined words and get for each words correction Suggestions located at the right-located section. Tap a Suggestion to read it aloud and tap the Description area to read aloud explanations or usage examples for that Suggestion. To select a Suggestion, Double-Tap or Swipe it. Further tap at another underlined word and correct it. 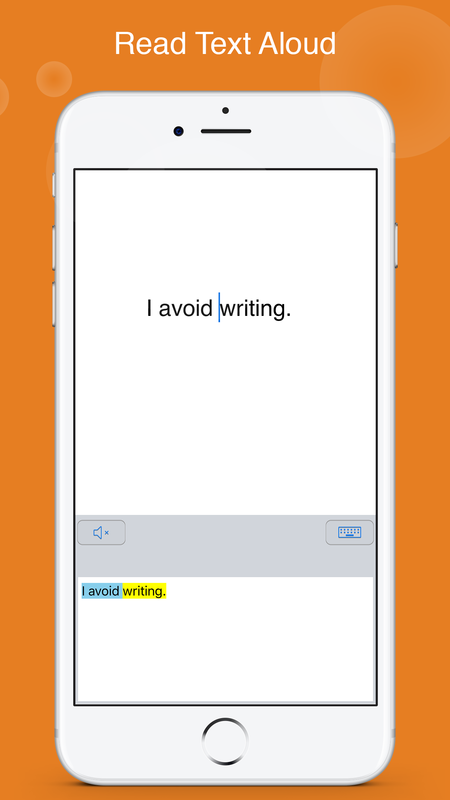 When done, apply the corrected sentence by tapping button “V” and waiting for a second till the correct sentence replaces the original. • If you do not want to correct something, just tap the Back button with keyboard image. To read a sentence aloud, place the cursor somewhere in the middle of the sentence. Pay attention not to select words. Tap the Speaker button. Text is read aloud. in line with Apple’s practices for adding a new custom keyboard, please do the below steps:• Open the Settings and go down to General. Tap Settings. • Scroll down and tap Keyboard. • In menu Keyboard, tap the top entry Keyboards. • Tap “Add New Keyboard”. • In “Allow Full Access”, move the switch to the right to Allow. • Open up some editor or text area to write some text. • Tap the Globe icon on the keyboard until appears Dyslexia Keyboard. • If you do not hear text-to-speech voice when reading aloud or tapping predicted words, please check that Full Access in “Allow Full Access” is enabled as described above and voice at your iPad has not been muted in Settings or by a Side-Switch. English is not my native language, but is the language I use the most during work. Until now my English spelling has been so poor, that it affected my overall work performance. But since purchasing Ghotit, both my writing and work performance has improved dramatically. Thanks Ghotit.